On 19 November, Maruti Suzuki India, a Suzuki subsidiary in India, announced that it has launched the Suzuki’s newest and most compact passenger car, the A-Star, in India. 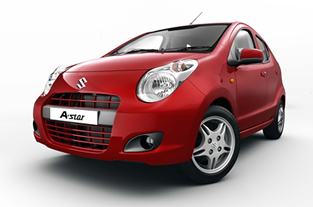 The A-Star is Suzuki’s fifth world strategic model but is the first to make its world market debut in India. Built at Maruti Suzuki’s Manesar plant and powered by Suzuki’s K10B 1.0-litre engine, it offers a kind of compact, fuel-efficient mobility for which there’s growing demand from Indian motorists. From spring 2009, this model will also be shipped to Europe, its main export destination, where it will be known as the Alto. Environmental credentials including Euro5 compliance and CO2 emissions of only 103g/km for European model will help to ensure its success in the ‘A’ segment of the European market. Exports to other markets will follow.